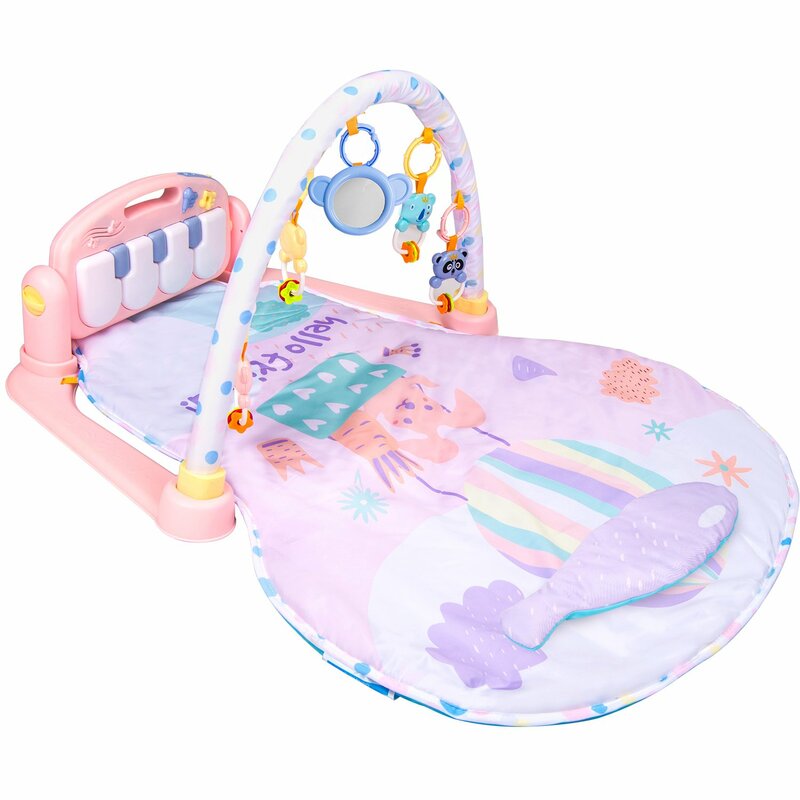 The idea of something that makes boingy noises as your baby jumps on it seems to be a good one, but when they implemented the concept into this item, it came up severely lacking. If on music mode, it doesn't complete one song before moving to the next. 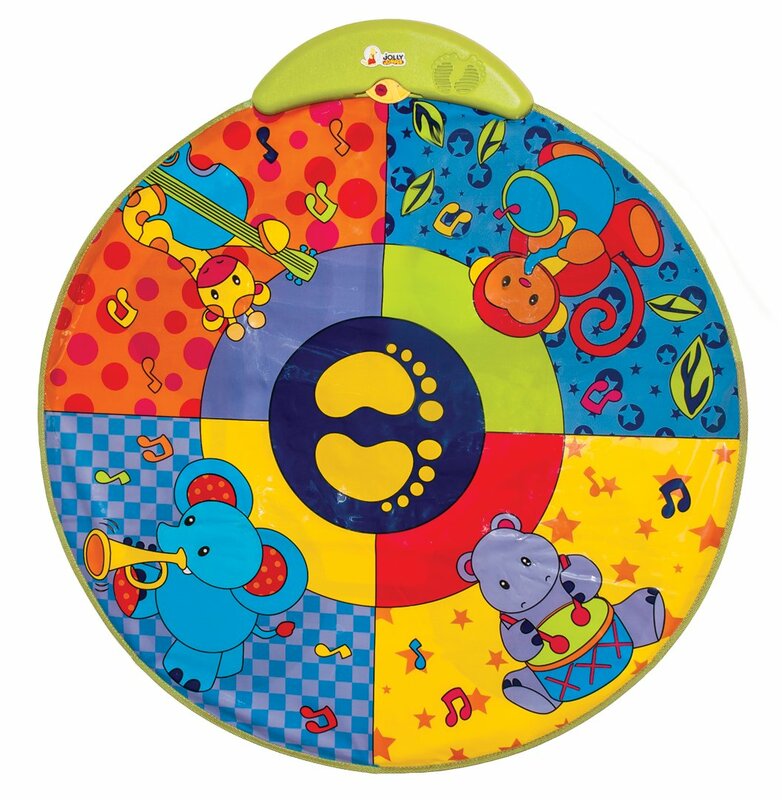 So as your baby bounces, you get the first 3 notes of one song and the first 3 of another all mashed together. The jungle sounds are about the same level of annoying. The sound effects are somewhat tolerable, but not really engaging to the baby. 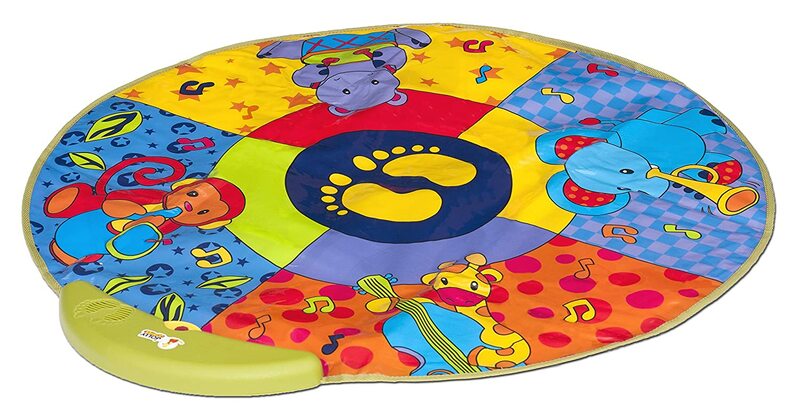 As if those annoyances weren't enough, this thing slides all over the joint as baby bounces. I was constantly having to move it back under baby's feet. Really not worth the money. Just put some crinkle paper under baby for the same effect with no money out of pocket. This is a neat concept with horrible execution. The positive is bright colors and size of mat is good for door jumper. The cons are 1- No volume control which would be ok if it was at the usual kid toy decibel level. It is so loud I had to put a towel over the speaker. 2- The individual sounds are not that horrible, though not that desirable either. The problem is they go off all together regardless of where you touch the thing- it is very chaotic like putting three toys on at one time. My 6-month-old hates it and he was scared by the volume. He likes the crinkly sound it makes when he jumps with the sound turned off, but I could put a paper bag under the jumper for free. Little one REALLY likes this. It has multiple sound options, too - which enables me to select the least annoying one. My biggest complaint is it slips and slides away. Very annoying when you have to constantly readjust it. A little double sided tape did the trick but it should have a better bottom. Made in China. Gives off chemical smell. Not bpa free. 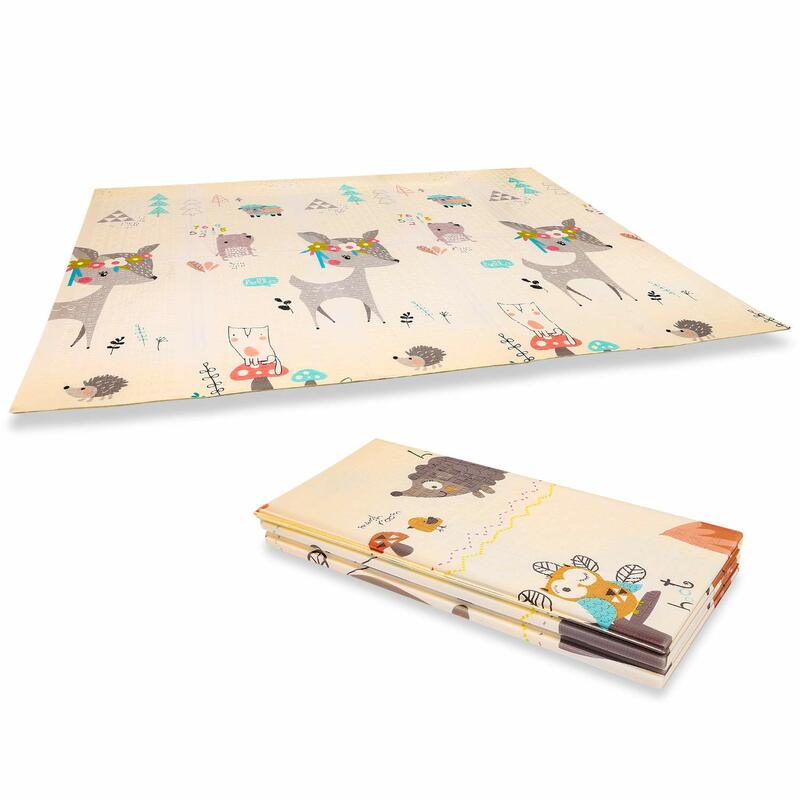 Looks like a cool mat but not willing to let my baby breath in and be exposed to all those chemicals. You can watch all of the videos on YouTube to see how much kids love their Jolly Jumpers. Our kids were no different. They absolutely love their Jolly Jumpers and this mat. We love these Jolly Jumpers with stands. They are perfect for our downstairs where we do not have adequate doorways for the hanging kind. The mat that comes with this is really fun. 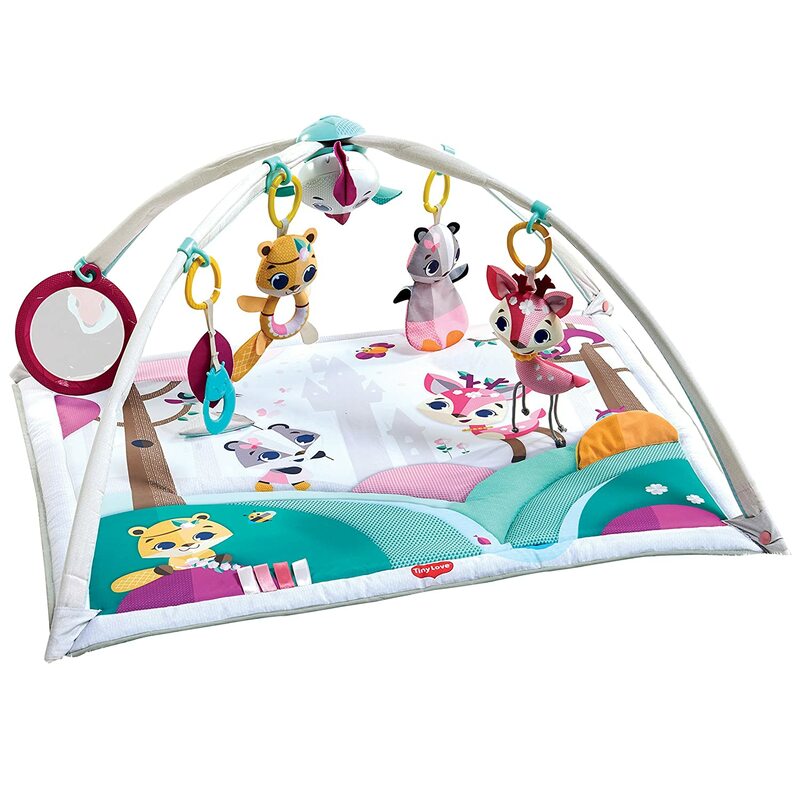 It has three settings: Jungle (jungle sounds), Dance (happy beats), and Silly (funny sounds). The kids absolutely love jumping up and down on this. It is also very easy to clean up if the kids drool on it. The key is to read the instructions though because children should be in these no longer than 15 to 20 minutes, for safety reasons. One of the best purchases made. It's the only way my child will play in her jumper. We even use it to entertain while she is playing on the floor. She gets so excited to see this being pulled out to play with. Love the different sound options so you aren't bombarded with the same sounds for hours. This is a great addition to the jumper. My granddaughter also used this for tummy time. It was a delightful change of pace. This a great idea and fun for baby. However, I thought it fit under the Baby Eintsein Jumper. It is too small. It bunches up if baby's feet are bare. It should be the same circumference as the base of the jumper and have a way to secure it to the floor circle that supports the jumper.